The intersection of fashion and technology has lead to some intriguing designs. Garments functioning as air and water purifiers are now being marketed. 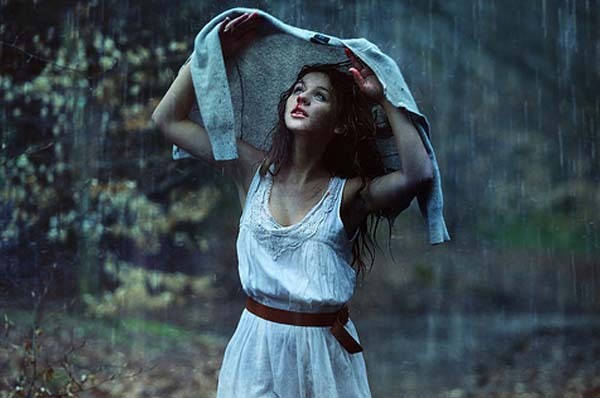 A raincoat that turns rain into drinkable water is one such innovative design which marries fashion with hi tech. For the first time, those out in wet weather will be able to enjoy refreshing rainwater on the go, just as it falls from the sky, without having to worry about pollution. A couple of students from Copenhagen have designed a water -purifying raincoat, which allows people to store and filter rainwater for drinking, using just the jacket on their backs. The multipurpose coat, designed by Hyeona Yang and Joseph Noble, students at the Copenhagen Institute of Interaction Design, collects rain through its collar and filters it through the coat with charcoal filters purifying it by way of a chemical process. The purified water is then stored around the shoulders and pockets of the coat balancing the weight so as to be most comfortable to the wearer. 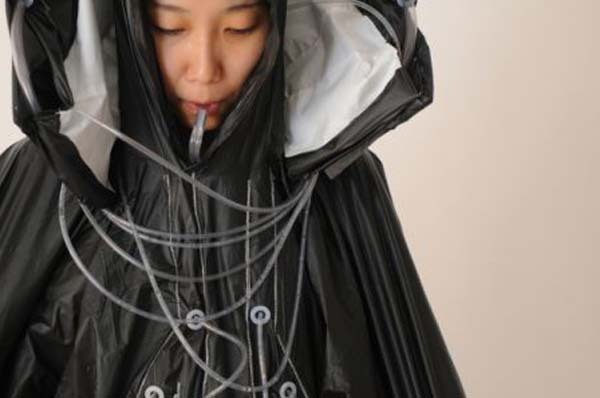 Tubes woven into the raincoat allow the wearer to drink the water that has been collected. Apparently the raincoat was designed as a water pack for backpackers trekking off to places where there is limited or no access to filtered drinking water. Or for citizens of countries where there is a scarcity of clean drinking water. Reaction to the actual look of the raincoat has been mixed; with some saying it looks pretty cool and others describing it as ugly. The critics are a bit harsh. It does not look like a ‘plain giant plastic bag full of tubes’ as one blogger described it. On the other hand I am not sure it would go down well for lunch at The Ivy. On the other hand, come to think about it, at a distance it looks like a cape with tall collars. And there is the fact that it saves carrying around the ubiquitous bottle of filtered water. Thumbs up for this useful piece of clothing. By collecting and purifying rainwater into drinkable water, Raincatch (as this raincoat has been named) means the wearer can enjoy filtered water on the go. And this is not necessarily restricted to people traveling in third world countries. As one British blogger has pointed out, having a Raincatch while living in a rainy city like London, would mean that you will probably never be thirsty again.